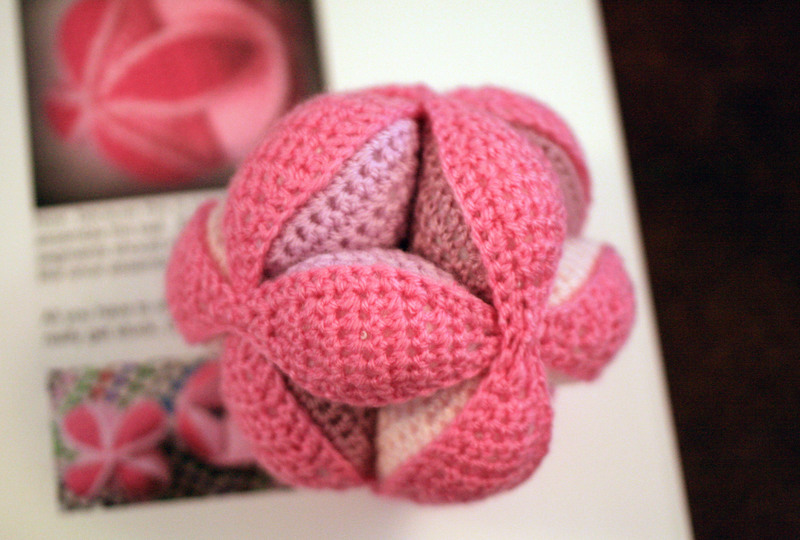 I looked up the Amish Puzzle Ball and it looks like they were made from scraps from the quilts they made. And, of course, they are a puzzle. When put together they form a ball that can be used indoors. 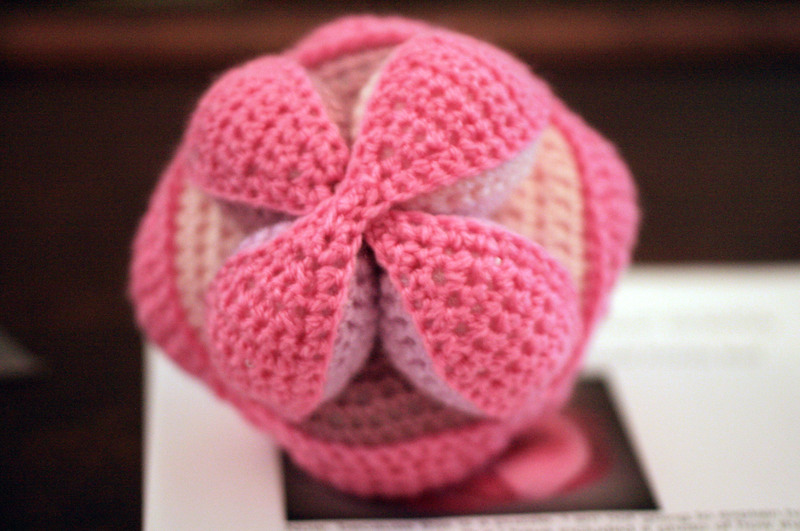 That aside, I enjoyed the photos you posted of this ball and the link to a pattern is always a plus. I am now following your blog and l would like to invite you to check out my blog. I think you may have been looking at my blankets and matching balls. They are a great idea and such a clever design I think. Love your blog and am not following you too. looking forward to staying in touch. Last night I finished the wash cloth. Nothing fancy, just works for me. Now, finish the hat. Pleased to hear you are getting on ok, you will always keep learning I am sure. I get stuck sometimes and have to ask my children to help! Oh I’m sure! I just follow my nose and listen to my instincts. I’m going to leave line shortly and work on a new hat. But will be back around dinner time. See you next time, looking forward to seeing the new hat. Thanks! Tonight I think I want to work on some wash cloths. My linen closet needs some!! Hey, I got about half of the wash cloth done. now I guess I better do the other half. Well done you, look forward to seeing your completed wash cloth. Hey! Last night I finished the wash cloth. It’s nothing fancy, although it works for me. I’ll get a picture and upload it in just a while. What a beautiful ornament! Great idea for Christmas presents. Thank you, the cat is the only item I have made and kept for myself, I love him too. I have just bought the pattern to make an elephant version of this puzzle so am very excited to get started. This is the coolest thing ever! I’m a bit challenged when it comes to visualising things in 3D, so I’m rather confused about how it all fits together, but it looks so pretty! It is really difficult to tell how it goes together with words other than to say that once you have the three rings in front of you it does become obvious. I will definitely be making another one so next time I will try and take more images to show the connecting route. Thank you for checking out my new blog. I love your work. It’s beautiful! I’m still learning my way around so I’m a little slow. Please keep checking again. My pleasure to welcome you, will visit again soon. Let me know if there is anything I can help with. Yes, please, I do need help. I’m too tired this evening although I will be back in the morning. I haven’t figured out how to get my pictures on the same page with the text. I do finally see ho to get pictures on, although again, not on same page. Go into dashboard, click on posts, open one of your posts, click underneath your photo and the curser should show but even if it doesn’t just type something and the text should start to appear. It can be a bit confusing until you get used to using it but the other way would be to click on new post, type in a title, then click the curser in the page section and type a few words, then go to the top of the page and click on add media to add your image as you must already have done. Let me know if this works for you. 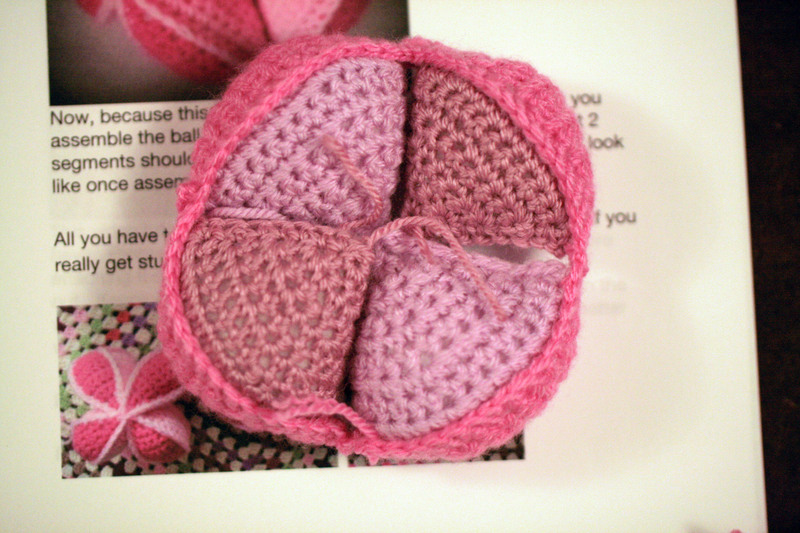 How exciting, have a look at the link because if you find out on monday that it is a girl there is a flower version as well, I am going to make that one next week to see how it looks. The pattern is all the same colour flowers but I think I will use more colours. Very pretty! Looks like fun to create too. Definitely fun to make< I could not see how it would actually go together until I got all three rings made, then it became obvious. It looks perfectly executed. I ve seen these before and have always been intrigued. Lovely colour choice. I would be chuffed with this make. 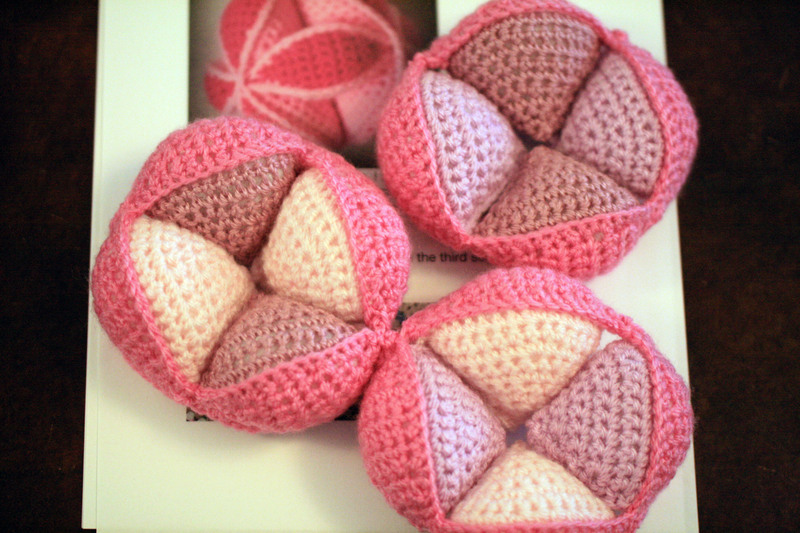 Thanks, I have downloaded the pattern for a Flower version now too so am looking forward to giving that a go soon. It is fabulous. A must have for any new baby! I will be bookmarking this and using it for the next arrival. None planned but they are not always! LOL! Have you ever heard that a butterfly in your home means a baby is coming? Well I hadn’t until a couple of weeks ago and guess what happened last week? Yes that’s right, I was sitting quietly crocheting away and a butterfly flew into the lounge. Well it definitely is not me but I have two daughters………. I may be making more of these sooner than I had planned! 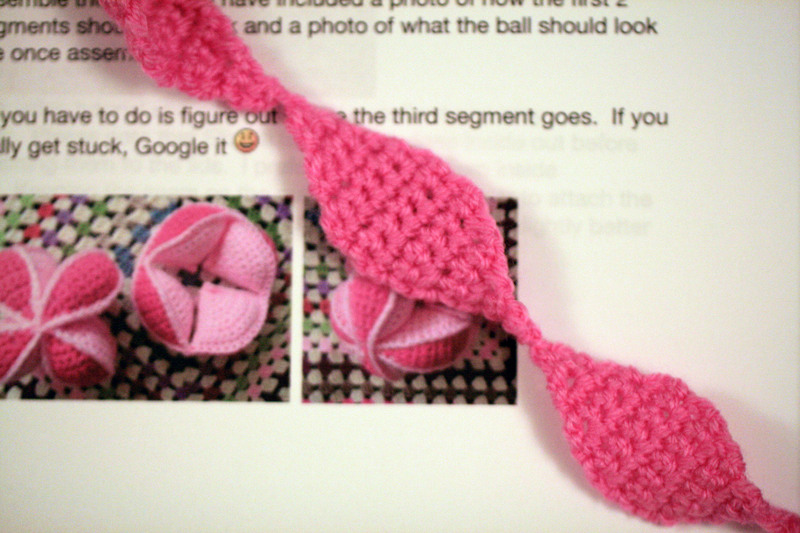 It really is simple once you do it, I think it looks more difficult in the pattern than it actually is. Thank you, I look forward to seeing your progress with your cross stitch, that is far more delicate work. I think it looks beautifully put together. 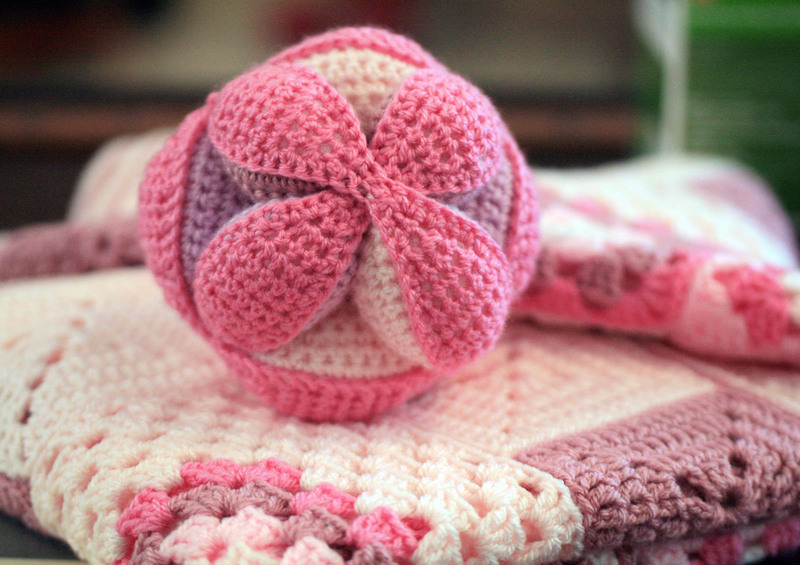 The colors are perfect and it would go well with a baby blanket as a gift. Thanks for sharing this. Thank you, I will just have to wait for the next baby to come along to gift this set. Love this! I will have to give it a try!! Oo, I may have to make one or two for my nephews. Not sure I like all the sewing together, but I love the end results, and playing with the color choices. Yes, I am looking forward to playing with mixing up the colours a bit more, I only used four but I think five or more would work better. 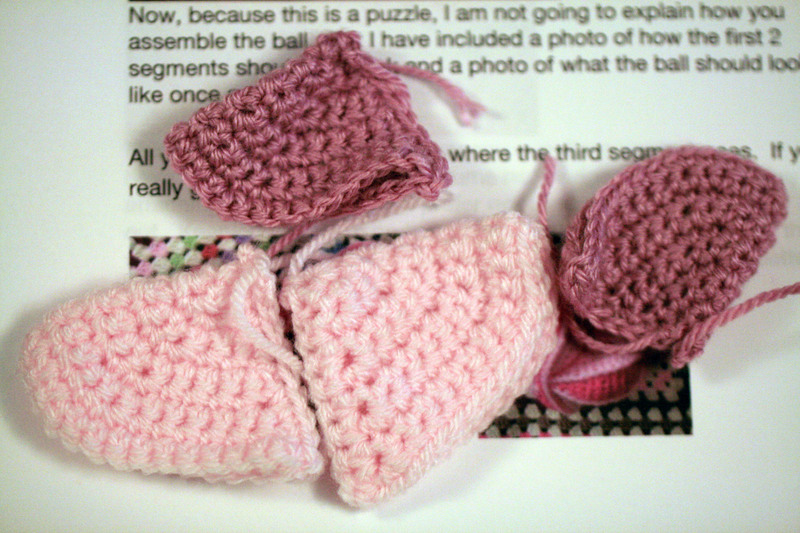 Try crocheting it together rather than sewing I find that much easier, or at least less tedious. I saw something similar on Ravelry and just by the looks I assumed it is really complicated to make. Now I see how easy it is and that it can be disassembled and reassembled easily (or so it seems). It is definitely going to my faves list. The pattern is from Ravelry by a lady called Dedri Uys who has generously offered the pattern free. The pattern has gone into my archive to be reused again and again. Have you been making one too, it does look very complex but once you have made the three rings it actually goes together quite easily. No, I have not been making one, but you have wet my appetite, now where is that hook?……. Look forward to seeing your creation. It is quite amazing, I could not see how it would work by looking through the pattern so I had to make it as I was intrigued. I had not thought about a cat toy, you could put cat nip inside it too.